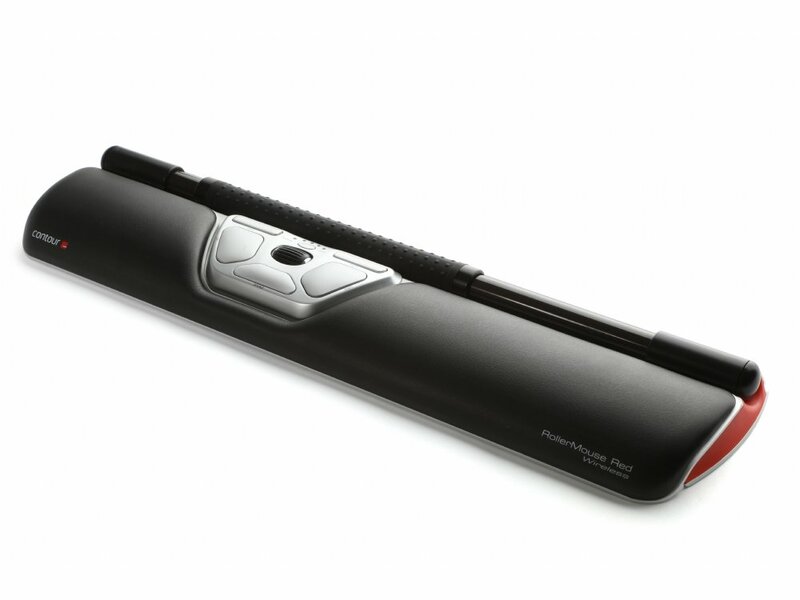 The Contour RollerMouse Re:d is a 'bar' pointing device with detachable wrist rest. The bar moves left and right to move the mouse pointer left and right, and rolls to move the mouse pointer up and down. With its wireless connection option, the RollerMouse Red Wireless gives you both full control and freedom of movement. If you hot-desk or occasionally need to change your workplace, the new wireless Contour RollerMouse makes this easy - without losing any of the benefits of a Contour RollerMouse. If you spend much of your time in front of a computer, maintaining a good posture is essential. A centred mouse like the Contour Roller Mouse makes working at a computer less demanding. Award-winning design and great flexibility. Contour RollerMouse Red's aluminium casing, with its soft brushed aluminium and characteristic subtle red details, won the Red Dot Award when it was launched in 2013, and remains stylish today. The wireless versions also make it much easier to keep your desk tidy and there's no need to worry about cables. RollerMouse Red Wireless comes with several wrist support options, including a short wrist support adapted to suit your lower forearm and hand or if you simply do not have very much space. You can customise the mouse to suit all your needs and will quickly learn to work more ergonomically and productively thanks to its intuitive and intelligent features. Maybe you work with multiple or large screens and require unique customisation? Then RollerMouse Red Wireless is just what you are looking for. The wider your workspace, the further your cursor needs to move, and therefore you need to be able to adjust its speed - something you can do easily and quickly with the RollerMouse Red family. Say goodbye to stresses and strains. 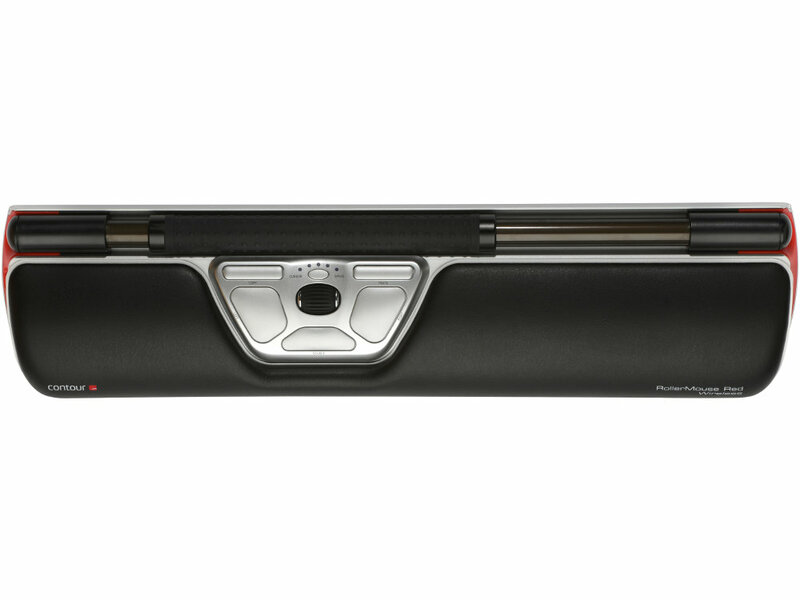 The stable, rubberised rollerbar with a textured surface allows you to easily move the cursor and click with accuracy. Greater precision and control enable you to work more efficiently without getting tired. This is my third Contour RollerMouse Red in a number of years and my first wireless one. I used to suffer from RSI from my wrist all the way up to my shoulder at it's worse - over time this device has completely eliminated that problem. That alone makes it worth spending so much on a pointing device. However, what I didn't expect was how much more efficient it would be, having keyboard and mouse complete central with no reaching arms, along with copy & paste functions as buttons literally at my finger tips has been a huge boon. I use it with both Windows and Mac and it works perfectly - although you will need to install the OS-X driver to get full features on mac. I found the beta drivers for Windows a bit flaky - especially in Visual Studio. Fortunately all the buttons on RollerMouse Red work on Windows without any drivers.